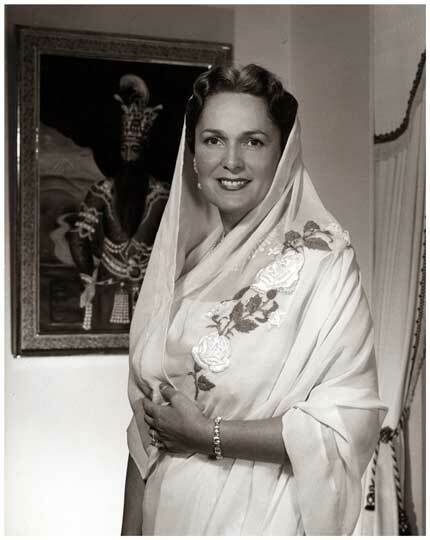 Begum Om Habibeh Aga Khan (15 February 1906 – 1 July 2000) was the fourth and last wife of Sir Sultan Muhammad Shah, Aga Khan III. The couple married thirteen months after the Aga Khan III and his third wife were divorced by mutual consent. The Begum was well known for her generosity towards and compassion for the impoverished and the elderly. Her Egyptian Om Habibeh Foundation worked towards the alleviation of poverty and the improvement of quality of life in the area surrounding Aswan, Egypt, and in Le Cannet she established a retirement home. She was particularly interested in women’s issues and, an accomplished artist and sculptor, she was also interested in the arts including classical music, ballet, and the opera. The Begum died at the age of 94 in Le Cannet and was buried in the mausoleum of her husband at Aswan. 14" x 11" original silver print with Halsman's stamp on the reverse. Dated 1955.